1. Macadamia integrifolia Maiden and Betche. 2. M. tetraphylla L. Johnson. Cultivars grown in Hawaii include ‘Kakea’, ‘Kau’, ‘Keaau’, ‘Makai’, ‘Mauka’, ‘Pahala’, and ‘Purvis’. 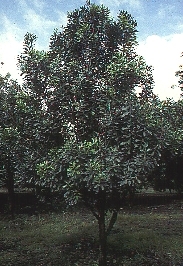 Cultivars are distinguished by crown shape, and upright types, such as ‘Kau’ and ‘Keaau’, are being favored over more spreading types recently. ‘Keaau’ produces medium nuts with high percent kernel (44 percent) and is high yielding. ‘Cate’ is one of the most widely grown M. tetraphylla cultivars in California. Both species are native to the east coast of Australia, from rain forest-like climates; M. integrifolia is more tropical in its requirements than M. tetraphylla. The Hawaiian industry and tropical production is based on the former, whereas the small production in southern California is based on the latter. Nuts were brought to Hawaii and California in the late 1800’s, but only the Hawaiians developed nut culture, whereas the Californians used it initially as an ornamental. United States – (2004 USDA FAS) 21,133 MT or 46 million pounds. (in-shell nuts). Virtually all production is in Hawaii on about 18,000 acres. The small volume of rough-shell macadamia produced in California is not included in USDA statistics. The value of the industry in 2004 was $33.1 million. Price paid to growers is about 65¢/lb. Yields average about 3,000 pounds/acre. The United States consumes the majority of the world’s macadamia nuts, importing an amount almost equal to domestic production. Plant: A medium sized, tropical evergreen tree, with spreading, full canopies, reaching widths of 30 ft and heights of 20-30 ft. Leaves are linear-obovate, 4-6″ long, sparsely dentate with sharp teeth, and thick; gives the overall impression of a large holly leaf. Flowers: Flowers are perfect, and most cultivars are self-fruitful, but sometimes yield better when cross-pollinated. Flowering is not synchronized; trees may have flowers, immature and mature nuts all at one time. Flowers are borne on long, fragrant racemes (4-8″) of dozens of individual flowers, from lateral buds on 1-yr wood. Flowering occurs in mid-winter and nuts are harvested 7-8 months later in July-November, although some nuts mature more-or-less year round. Pollination: Bees are the pollinators; cross-pollination is necessary for full production, but the degree of self-incompatibility varies. 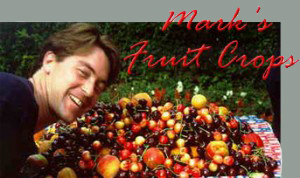 Fruit: Botanically a drupe, the fleshy outer portion is removed to reveal the nut. 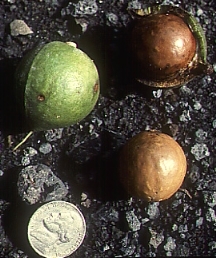 Nuts number from 10-30 on crowded stalks, and are covered with thick, shiny green hulls (=mesocarp and exocarp), which are adherent to the shell (=endocarp). Nuts are round, with kernels enclosed in hard shells, with shelling percentages of 40%. Soils and Climate – Deep, well-drained, soils with a pH of 5.5 to 6.5 are best, but trees are grown on a wide variety of soils. In Hawaii, they grow well on lava rock soils. Although tropical trees, macadamias tolerate mild freezing (28-32 F), and do not tolerate excessive heat; In Hawaii, cool ocean breezes allow cultivation at sea level, but inland in the tropics, trees must be grown at 1500 – 3500 ft. They have no chilling requirement, but a seasonal change in temperature may help to synchronize bloom. Propagation – Whip grafts or side wedge grafts are made on young seedling rootstocks . Rootstocks – Seedlings of rough-shelled (M. tetraphylla) cultivars are the best rootstocks because they are more vigorous and hardy than smooth-shelled seedlings. Planting Design, Training, Pruning – Tree spacing depends on growth habit of the cultivar and the use of filler trees. Final spacings of 30 to 35 feet apart are typical. Closely spaced hedgerow orchards are sometimes used in Australia, with trees planted at 10 × 20 feet and later thinned to prevent overcrowding. Macadamias are trained to a central-leader framework over a period of several years, as they grow slowly. Nuts are harvested largely by picking up by hand, although mechanical harvesters are being evaluated. Harvesting may extend over a 6-12 week period. Harvested nuts are de-hulled mechanically and dried to low water contents (< 2%). Nuts are cracked and sorted to remove off-color kernels and pieces of shell. Kernels are graded into 2 classes flotation; Grade I kernels (>72% oil) float and Grade II (<72% oil) sink. Most of the crop is used for confectionery, but whole kernels are roasted and salted and sold in jars/cans, usually in “gourmet” sections of markets. Macadamias are considered to be among the finest table nuts in the world. They contain high quantities of oil, and are therefore very fattening.